Sold out! Please check back in summer 2013. You've found the right spot for buying Egyptian onion sets in bulk at a discount! But don't bookmark this page and plan to come back later --- we're just a homesteading duo selling off a few spare top bulbs, and we will probably run out within days. I'll be sure to update the page to let you know when our Egyptian onion bulbs are no longer available. 100 bulbs will be enough to start a good-sized bed that will feed one or two average people. Your package will contain small, medium, and large bulbs. This size is for the grower who really wants to feed an army, or a big family the first year. Your package will contain small, medium, and large bulbs. Egyptian Onions are perennials that multiply by creating small bulbs at the top of a leaf stalk, each of which can grow into a parent plant. The onions are also known as Walking Onions, since if you leave them alone, the stalks will bend down and plant new onions nearby. 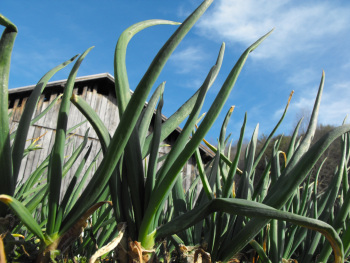 As long as you don't overharvest your onions, you will find them to be a dependable source of green onions and leek-like bulbs for about 9 months out of the year, making them a great way to eat in season. How do I grow Egyptian Onions? 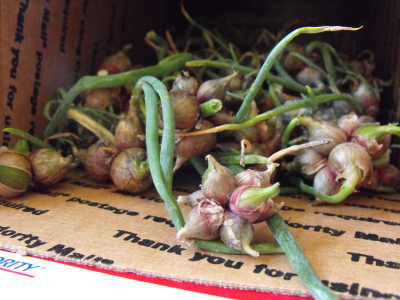 Once you receive your bulbs, plant the Egyptian onions as soon as possible in good garden soil in full sun. The very top of the bulb should be poking out of the ground, but the rest should be submerged. Some people recommend planting them a foot apart, but I've found that my plants do well in raised beds spaced only about three inches between centers. Leave the plants alone for a few months, then you should be able to start harvesting green onions in the middle of the fall through the winter. By early summer next year, your plants should be putting up top bulbs, each of which can be planted to expand your patch. 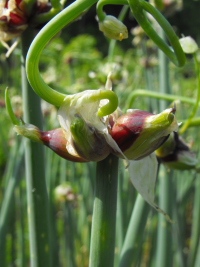 Egyptian Onions grow well in zones 3 through 9 in full sun to light shade. How do I eat Egyptian Onions? To maintain a perennial patch, cut only every second or third leaf, making sure that the plant has enough green leaves to continue growing, then eat those leaves in any recipe that calls for chives or green onions. You can also dig up entire bulbs in the winter to use in recipes that call for leeks, but you'll want to let all your plants keep their bulbs the first year. 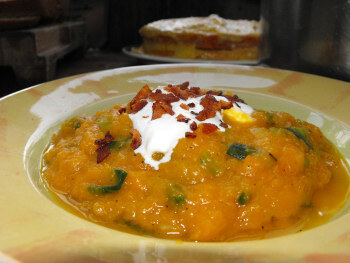 Our favorite Egyptian Onion recipes are Parsley and Green Onion Egg Salad and Butternut Squash and Egyptian Onion Soup. What will come in my box? If you order our Egyptian Onion sets, you will receive several clusters of top-set bulbs like those shown in the picture here. I don't include the smallest bulbs when counting --- they may or may not grow --- so you will actually receive several more bulbs than you ordered. Just break the clusters apart and plant each bulb singly. Please bookmark this page so that you'll have growing and eating instructions to go with your bulbs. Your onions will reach you in 6 to 10 business days. When will your onions be available in 2013? Charlene --- We will definitely have some looking for homes around June, but chances are we'll just give them away like we did last year. So, stay tuned to the blog and you might get some for free. would love to have some. You mentioned in reply to an earlier post that you might have some onions available in Jun. Do you have any available for sale yet? when will you have walking onions for sale again. Kellee --- We're still using our onions as giveaways. Stay tuned to the blog and you'll likely win some for free this summer.